If you’ve been following the news of e-Commerce lately, you simply couldn't miss the fuss about the release of Magento 2. 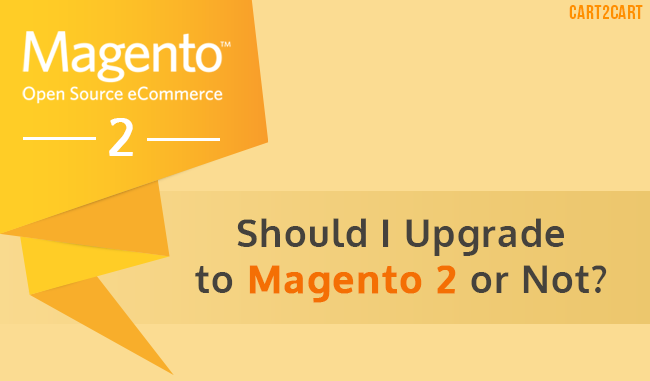 Most certainly, you do already know what are the differences between Magento 1.x and Magneto 2. You also should have heard about the benefits of the platform’s second generation. Nonetheless, having all the info at your disposal, the idea of upgrading to Magento 2 may still seem to be not reasonable enough. And that’s OK. A few months ago, nobody would have enough courage to say that Magento 1.x is bad. Now, we hear Magento being slandered because of its flaws (rightfully or not) here and there. Obviously, Magento 2 got enhanced. For about 5 years, a talented team of programmers was working hard to endow the shopping cart with the finest e-Commerce functionality out there. And even though they undoubtedly succeeded , it doesn’t make Magento 1.x worse itself, does it? To know whether you should consider upgrading to 2.0 as your prior task or not, there’re a few questions to answer first. To begin with, let’s face the fact that there’s no way back for Magento. Sooner or later, the community will get focused solely on version 2.x up until the time Magento 3.x appears on the shelves. Ultimately, this means you’ll gradually stop receiving any security or functionality updates for your plugins, themes and the platform itself. Full Page Caching - one of the essential improvements that allows to lighten server loads and accelerate page load speed by up to 50%! Eventually, it will cause a positive impact on SEO of the website, as well as on shopping experience of your customers. Streamlined Checkout Process - brings significant changes to checkout page called to reduce the rate of shopping cart abandonment, but increase conversions rate instead. We're pretty sure that the best Magento 2 features are yet to be offered. Just give some time to the developer community to get comfortable with a brand new modular architecture, enhanced file structure and improved testing framework. When should I upgrade to Magento 2? Since most of the popular extensions are compatible with Magento 2 already, and the platform itself has proved to be fully reliable, the answer to the question “When?” is “Now, or a bit later”. Everything is simple: if your store is performing well, and the platform version is not anything lower than 1.8 -- you could keep your current Magento store for a while. On the other hand, if you’re experiencing some serious performance troubles, have a boatload of questionable 3rd party modules or still using an obsolete Magento 1.7 or lower -- it’s certainly time to go. In this case, an upgrade to Magento 2 is an exceptional chance to get rid of technical issues, reconsider the necessity of plugins you’re using and get an advantage over competitors who tend to put the upgrade back. Killing three [sic] birds with one stone! Follow the step-by-step tutorial if you want to find out How to Upgrade Magento effortessly. Will the upgrade be painful? Quick fact about an upgrade to Magento 2 -- it’s not an upgrade actually. Since an internal structure of Magento 1 and Magento 2 differ so much, a switch to a second platform version requires a database migration. So the answer is “No, but it may cause some inconveniences and require extra investments”. The saddest part is that design, code customization and 3rd party extensions are impossible to transfer. Another thing you should know, is that unless you manage to take care of 301 redirects swiftly and accurately, your SEO may suffer too. The good news is that there are several options to perform an upgrade: you either could utilize official Magento scripts or an automated migration service, such as Cart2Cart. Both solutions are equally reliable, but work quite differently. While migration scripts require some sufficient programming skills and manual setup, Magento upgrade using Cart2Cart is fully automated. Also, the service allows to preserve your Google rankings at most by moving 301 redirects, as well as to migrate customer passwords for the convenience of your existing clients. To get a strategic advantage, start with a free Demo migration now and check out how your store will look like on Magento 2 within a half an hour!